Hoop it up anywhere! 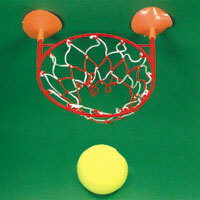 Soft foam ball, plastic hoop with suction cups. Ball is 3 inch. Hoop is 8 1/2 inch in diameter. $1.50 each for 96 or more. $1.30 each for 192 or more.